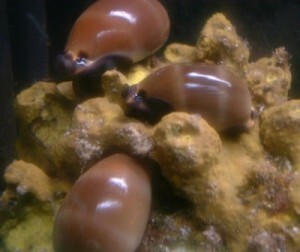 Bivalvia shells have filter-feeding kind of feeding. Gasteropoda is a much more complex group. 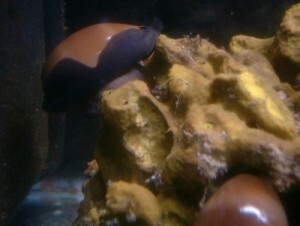 Some do feed on fixed animals (sponges), on algae, on grass, on other marine gasteropods, on worms, on fishes, on dead animals (necrophagous shells). Cone Shells are predators and their feeding habits are complex. We can separate them in 3 categories : Cone shell that feeds on other molluscs (molluscivorous), Cone shells feeding on worms (vermivorous), Cone shells feeding on fishes (piscivorous). 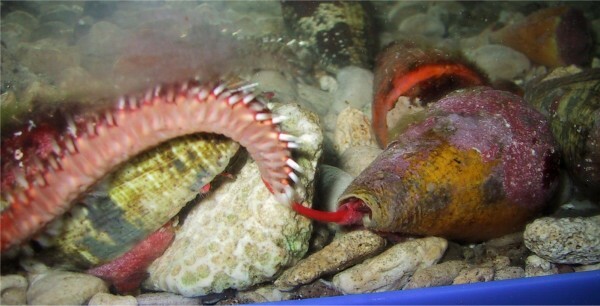 It is easy to understand that Cone shells need venom to kill their prey. That is the reason why they are potentially dangerous for humans. And of course species that feeds on fishes have much more powerful venom that the others. Here is the reason why some species could kill a human with a single shot ! Lethal species like the well known Conus geographus have to be handled with care when live ! On this video, you can see a Cone Shell attacking a clown fish. It's really fast and the fish is instantly immobilzed by the venomous sting. Just imagine what big species like Conus geographus or Conus striatus can do to human if not handled with care ! 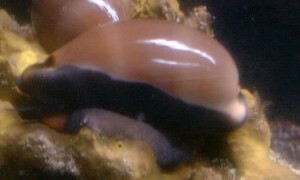 Muricidae feed on other molluscs (including Muricidae), they dig a hole in the calcareous protection of shells.